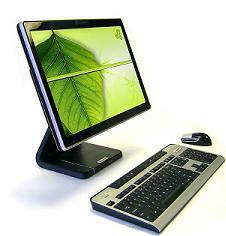 Major IT cost reductions over desktop PCs as a small footprint, All-in-One design allows for faster installation, relocation and operation at user's location - a traditional desktop PC requires installation and configuration of two pieces of equipment (PC Tower/Desktop and monitor). Take your IT support to the next level, by supporting more users per each IT staff member. Low Environmental impact and Low Carbon Footprint. Hazard-free and low cost disposal due to usage of non-toxic, recyclable materials and lightweight small footprint design: 100% ROHS Compliant; weight 9kg (20lbs); capacity/volume 0.009 cubic meter (0.351 cubic foot). Extreme energy cost reductions due to low energy consumption 74W versus 300W-600W for a traditional desktop PC. (53W min mode, 74W max mode; 1.2W S3, 0.6W power off. Increased lifespan due to lower power consumption. Highly flexible, fully customizable and upgradeable design to meet departmental and/or individual computing requirements i.e. Processor, Hard Drive, memory or optical drive. Optional touch screen or privacy filter available.